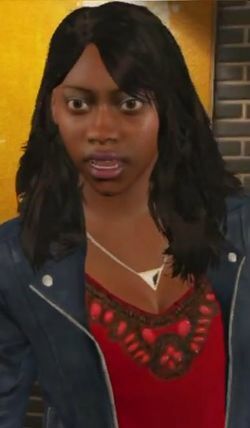 Tanisha Jackson is a character in the HD Universe who appears as a minor character in Grand Theft Auto V. She is voiced by Yasha Jackson. She and Jayden continue in their relationship, despite their different upbringings causing a certain amount on friction, and she becomes more active in higher circles attending events at a tennis club, The Richman Hotel and sushi restaurants. She receives a phone call from Franklin but tells him their relationship is over and will never work before going over to his house to inform him that Lamar had been kidnapped and that Stretch was behind it. She is later thanked by Lamar after he is successfully rescued by Franklin, Michael De Santa and Trevor Philips. She had also informed Franklin that she and Jayden were going to get married, while Tanisha had already revealed on Lifeinvader plans to go to Paris, France in 2014. Tanisha can also appear when switching to Franklin before he has moved to Vinewood Hills. She will be in his house arguing with him about their relationship before taking off in a taxi. Nice to be with a guy who saves lives rather than takes them. Is there a doctor in the house? In mine there is! Sometimes I have to pinch myself. Life is SO great right now! I cant believe I live in a neighborhood where people correct the spelling of graffiti! It's so great to be able to wear purple again!! Going for cocktails in the Richman hotel tonite!!! Guess what I got for my birthday...Johnny Tung shoes!!! There one doctor getting very lucky tonight! I really love sushi now. Makes a change to live on a block where the closest thing to gangbanging is rival book clubs!! It's so sweet the way Jayden corrects my pronunciation in front of people. Jayden's been teaching me proper table manners. He's such a gentleman! Looking around the tennis club I'm willing to bet a lot of money Im the only girl from Chamerblain Hills in here! Jayden says he's going to take me to Paris next year! Sometimes things happen to make you realize that you cant cling to the past forever. Why should I feel guilty about wanting to move on? I can't wait for the next chapter of my life with the man of my dreams! Going to get my nails done. Jayden told me they look too ghetto. @Tanisha: Thinkin bout my Forum bruthaz - Lamar n Frank. Stay safe babies. Do tha right thing. One of the things Tanisha likes about being with Jayden is being able to wear purple items of clothing, having previously lived in an area controlled by The Families, rivals of the Ballas who wear purple clothing. Her bleet is typed using slang, unlike her Lifeinvader updates, despite many of her Lifeinvader updates being posted before her bleet. This is Tanisha Jackson, I guess I'm busy, so you know what to do. This page was last modified on 22 May 2015, at 23:32.